Usually, the most important factor when selecting a chiropractor is his/her chiropractic technique. If you select a chiropractor who practices an unsubstantiated chiropractic technique, you may not see the results you expect. And here is the challenge: there are almost 200 different chiropractic techniques to choose from! New chiropractic techniques are easily created. Someone with a chiropractic degree names a new approach and declares that it works. In order for the technique to take off, the founder has to invest in good marketing and create an exciting pitch. This effort is usually enough to develop a following. Sometimes (rarely), the founder will publish one or two successful case studies, and then the technique will become canonized. Not all chiropractic techniques, and therefore not all outcomes, are the same. Some vary widely in analysis, diagnosis, and treatment. Some involve x-rays, some involve adjunctive tools, others involve hands-on adjusting. Please bear in mind that most techniques have not been vetted for reliability, effectiveness, nor outcome measures. This doesn’t mean that they don’t work, they just haven’t been tested yet. This creates confusion within and outside of chiropractic. It also means that not all chiropractors are not alike. Unfortunately, there is currently no professional standard which dictates how much evidence a technique must have. Before it can be used on patients and promoted within the chiropractic community, there should be research. When I was a chiropractic student, at Life Chiropractic College, we were taught to assume that all chiropractic techniques work. But the truth is that most techniques have never been critically evaluated, and would never pass muster in a true research setting. Patients assume that if a technique has gained popular acceptance and is taught in chiropractic school, it must be based on solid scientific principles. But sadly, this is untrue. It is therefore critical that prospective chiropractic patients become educated consumers. There are a few vetted techniques that are supported by documented research studies. The goal of such studies is to confirm that a chiropractic technique reliably achieves measurable results under conditions that can be reproduced. Unfortunately, one cannot rely on one’s insurance company for such information. Insurance companies will often list the most researched and proven spinal corrective technique as “experimental.” They will at the same time cover the cost of the least substantiated techniques. Please realize that insurance reimbursement/coverage seems to have more to do with what methods cost their company the least amount of money. If one technique doesn’t get you the results you seek, your chiropractor may try a different one. Or you may have to go to a different chiropractor for a better outcome. Personally, I have practiced and learned over 10 techniques in school and post-graduate. The technique I have found to be most effective, reliable and scientific is Chiropractic BioPhysics (CBP); researchers have thoroughly tested and proven effective by researchers. This particular technique is based on the premise that spinal structure matters. A compromised structure will continue to get worse as it faces the pressure of gravity. An abnormal spinal structure has been scientifically proven in hundreds of published Medical studies to negatively impact balance, strength, lung capacity, sexual function, life expectancy, gastrointestinal function, internal organ health, as well as cause back pain, neck pain, headaches, disability, etc. We have substantial data to determine the normal mechanics of each spinal region, based on empirical evidence from physical laws, mathematics, and scientific studies. All things being equal, the closer a person is to his/her ideal spinal structure, the healthier that person will be, living the best quality of life possible. The opposite also holds true; the further a person’s spinal structure is from normal, the more his/her health will be negatively impacted. The structure of a car, a bridge, a house will impact how that object will function. For example, a car out of alignment will see its tires and components wear on one side, causing the premature mechanical breakdown. The body is no different! The CBP protocol is to 1) determine how far a patient is away from ideal structural position, 2) test the spine to determine how much CBP spinal correction can be expected, 3) develop the customized treatment plan to get the patient the best results in the shortest possible time, 4) monitor progress towards the goal, both subjectively and objectively during the healing process, 5) prove that correction has taken place through post-treatment x-rays. Logic and science are the foundation to CBP protocol. It has resulted in life-changing, proven, published outcomes for over 25 years. It is backed by over 200 published CBP studies–more than every other chiropractic corrective technique combined! Those practitioners who practice the CBP technique have invested hundreds of hours to get certified or advanced certified, thousands of dollars in the latest equipment to correct the spine, and invested in their staffing and training to bring you the single most effective solution to save you from future spinal surgery. CBP practitioners correct spines, naturally! Warning #1: Make sure the process is something you can see, touch and feel. If it isn’t tangible, it may not be objective, and therefore not scientifically valid. That does not mean it won’t work, but I’d be skeptical. Don’t gamble with your health. Warning #2: Just because your physical therapist, osteopath, chiropractor, or yoga instructor says they are correcting your spine doesn’t make it so. If they are not analyzing your particular spinal structure with x-rays before starting treatment, developing a customized plan just for your spinal structure, and then proving the results with follow up x-rays, their claims may be unfounded. It makes sense that the treatment to correct structure should be customized if everyone’s spinal structure is different; no cookie cutter approach will work to alter your particular structure. 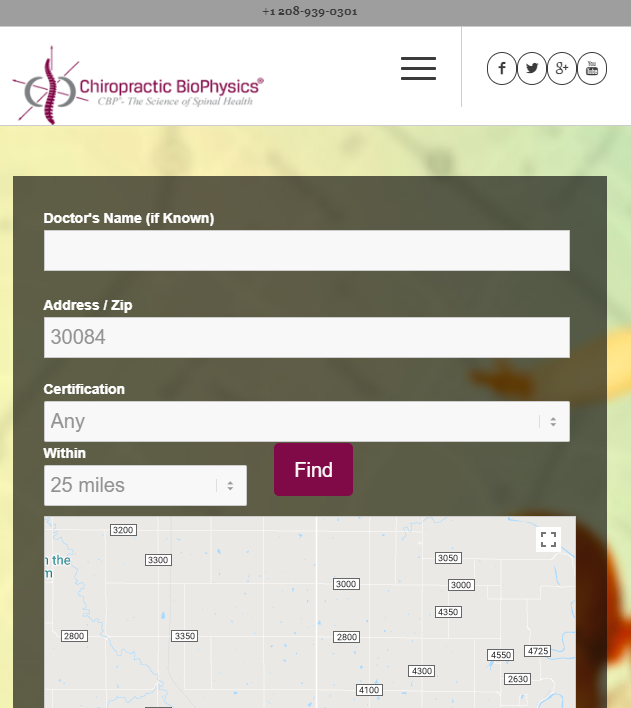 If you are looking for a CBP Chiropractor in your area, go to the CBP Doctor Directory. When you search for “ANY”, it will bring up anyone in the desired radius of a zip, city or address who has taken a CBP course in the last 2 years. 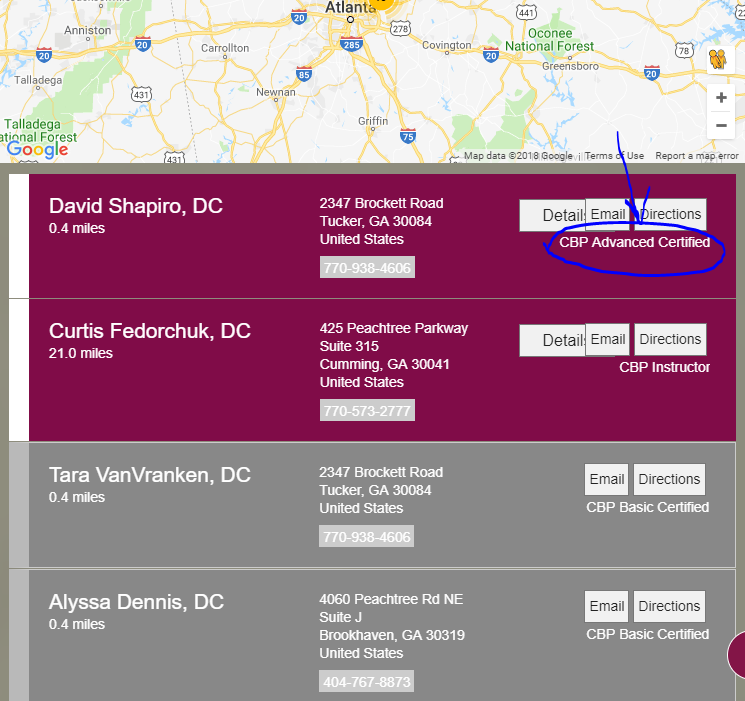 It does not mean that the chiropractor practices CBP in the office, nor that he/she has any CBP qualifications. You can narrow that search down by looking for CBP practitioners who are Basic Certified, Advanced Certified or CBP Instructors. I recommend you only reach out to Basic or higher level certified CBP Chiropractors for your thorough, scientifically-backed evaluation. See below for a picture of what a search and the results might look like.